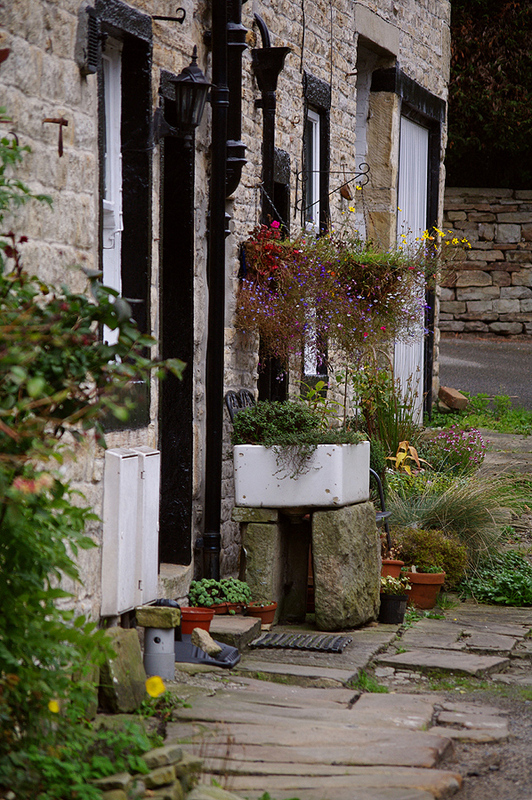 Our latest through the photographer’s lens entry from Geoff Tynan captures the unique and classic beauty of Yorkshire village, Cononley. All words and images credit to Geoff Tynan. 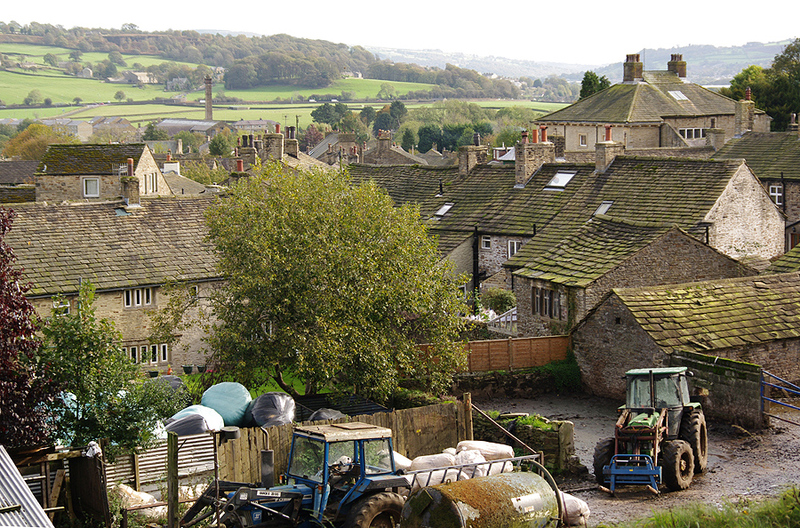 “I found this quintessential Yorkshire village While gazing from a train window. My daughter and I set out for an afternoon’s shopping in Skipton. I say shopping, my daughter does the shopping, I stand in the street looking for shots to take. 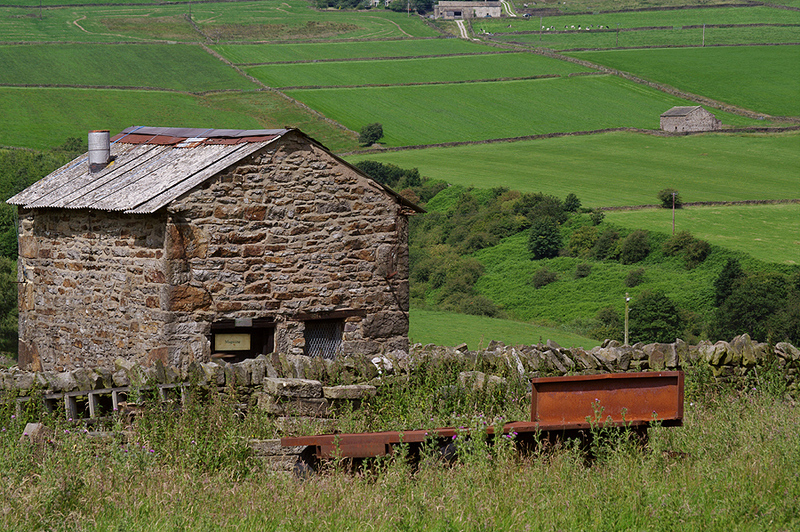 The train from Shipley passes through the mill towns and industrial remnants of the Aire Valley. As you travel further from this wool-signatured landscape, it becomes lighter in mood and fresher in colour. Hills rise and fall with blurry cottages and barns to catch the eye. The last village before Skipton is Cononley and as the train slowed to a halt in the station I was curious as to what lay beyond the “Way Out” sign. We continued on to Skipton, but my curiosity was still aroused. I promised myself a return journey. The day arrived a few weeks later and the weather was good. The camera bag was packed and the camera fully charged. A landscape this good required the tripod, no documentary approach this time. I stepped from the train and went eagerly for that “Way Out” sign, and there it was, a main street to rival any main street anywhere in the country. Those stone cottages that were just a soft blur from a speeding train window were now solid and glowing in the sunlight. Time had been kind to them and they had the look of an old weather beaten farmer who was happy to be still working the landscape he cherished. As I walked up the main street I was aware of running water to my left. A small stream with sparkling water from the hills above the village gently flowed beside me. It was plain to see those who lived here loved their little village. The houses were yielding to the landscape and its history. 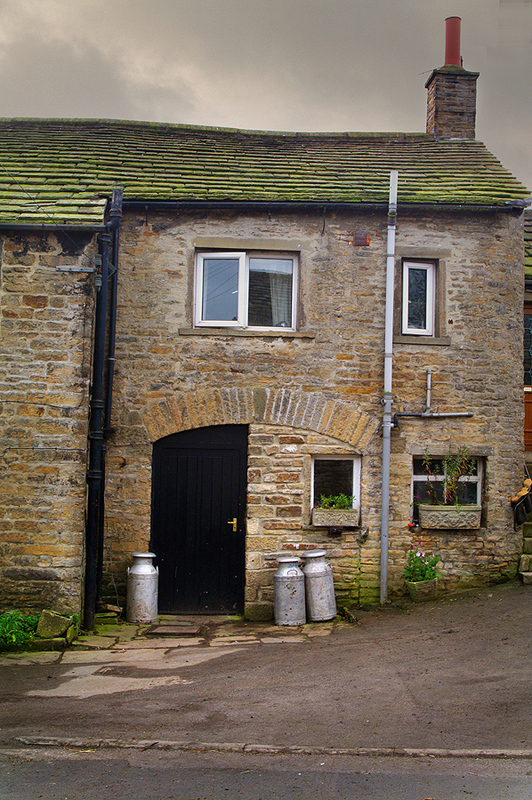 Roofs sagged under years of weather and Yorkshire stone slates, windows looked on at me their eyebrow lintels had a frown-like dip. They must have realised a stranger was among them. I walked further on to the local shop to get provisions. As I stepped out of the shop I became aware of three ladies with three dogs walking towards me. They spotted my camera gear and asked if I was from one of the Sunday supplements. I had to be honest and said no I wasn’t, although the thought did fill me with envy. “If only that were true” I replied. They then asked if I was up for a WI calendar…. you know…. that kind of calendar. With an embarrassed voice I said “madam I hardly know any of you” With that I made my escape. So Hollywood had reached these parts, or should that be these parts had reached Hollywood. I continued on and the village did not disappoint. It became more picturesque as I went along. I had passed two public houses and that seemed to be the extent of evening entertainment for the village. The New Inn and The Railway are the gathering points of the village. How nice it must be to be able to just step from your front door and in a matter of yards step inside the local pub and spend the time with friends. To discuss the days events and the future happenings in the village. The village church was as you would expect, small and surrounded by the graves of past generations. I had a quick explore and got a couple of shots of the gravestones and the grasses that almost obscured them. The church overlooked a farm that was barely distinguishable from the rest of the cottages. There it was with its slurry-covered entrance, where countless dairy cows had passed through making their way to the pastures beyond. Patience must be in plentiful supply here as there is not much room in the lanes for road rage and wildlife. A lady who came out from the farmhouse greeted me with a “good morning” I asked if I could take a shot of the farm and an old tractor that lay in state in the shade of trees in the yard. She said it was OK and I got my shots. 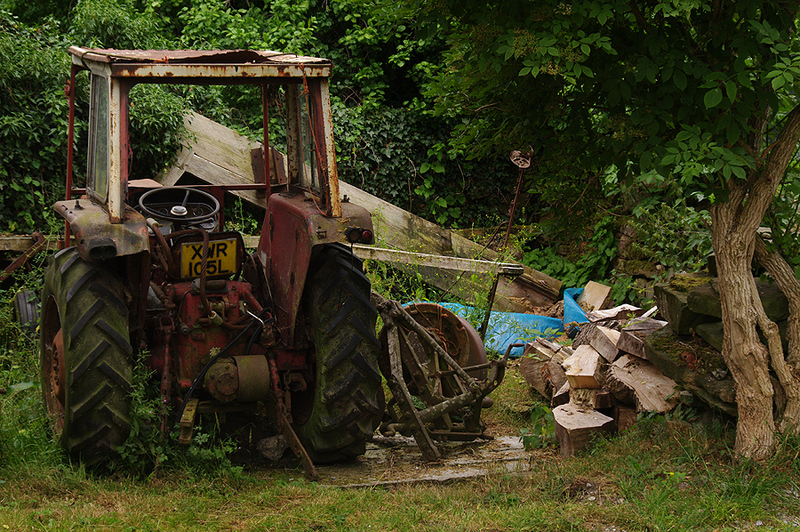 It must be compulsory in the farming world to have machinery kept on like old servants. Perhaps through a fondness for them. To cut a furrow now is beyond them, but you have a loyalty to them for faithful service. Across the lane near the cow shed lay an old dog keeping a watchful eye on me. “He’s alright, just don’t get too close” the lady said. My eye measured the chain he was attached to, gauging the “don’t get too close” distance I had to play with. Time to move on and see what was around the next corner. The lane from the farm started to rise steeply, the camera gear became heavier. I came across a chap in his garden cutting back some roses. I stopped to get my breath and started chatting with him. He told me about the old lead mine further up the lane. This news galvanised me to gather my gear and march on. As the lane slowly turned to the left the sight of a chimney that would not look out of place in the Poldark novel stood on the horizon. It was still a long way off and the legs were feeling the climb, but I had the summit in my sight. I finally got to the top and could see the workings of this un-Yorkshire structure. There it stood like a film set. The fields around all green and bleating with life, the mine there, with the earth’s insides turned out and spilling down the hillside. I went through the gate to the mine and just stood there and wondered. There have been mine workings here for hundreds of years. 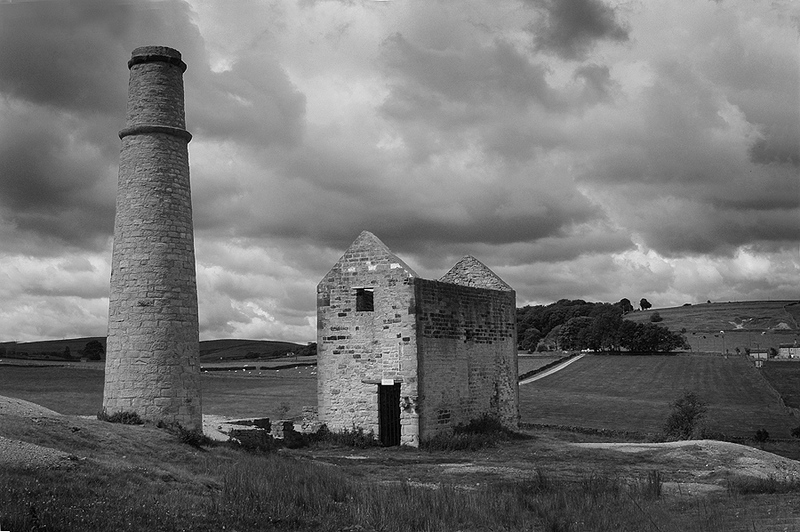 The mine as it looks today is from around 1842 and built by Cornish engineers/miners so the mine could be pumped dry. The mine currently looked after and maintained by the Earby Mines Research Group. I set to and set up the tripod on top of the spoil heaps. Rabbits scurried from warrens that honeycombed the heaps. I got as many shots of the mine from different angles as possible. I like to include as much of the landscape as possible to put things in its environment. Just shooting the buildings up close could just be a record of any similar structure. It was getting close to lunch time by now and decided to find a nice spot to sit, eat and ponder. I became aware of an old chap making his way across the fields towards the mine. He was laden down with a large rucksack. The rucksack being almost larger than him. He stopped at a spot of his liking and began to unpack. He set up an easel and began to paint. I could not resist the chance to see how he viewed this amazing structure. I want quietly up and looked over his shoulder. A water colour was in progress. What a fantastic article. Very talented with words and pictures. Thanks Janet. We’re very lucky to have Geoff writing for us and also very much enjoy his writing and photography! Next PostShrewsbury – It’s not just Black and White.